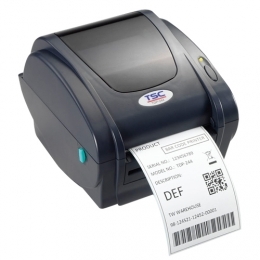 If you are looking for an affordable direct thermal label printer, then look no further than the TDP-244 from the brand name manufacturer TSC. This economy version combines robust double-walled housing with high quality label prints at 8 dots/mm 203 dpi. The USB connection guarantees simple integration into existing networks, as well as the standard integrated default emulations, such as EPL and ZPL. Max. medium width 112 mm max. print speed 100 mm/sec. Use the TDP-244 for product displays in retail, shipping labels, labeling of files and binders in small businesses and home offices, etc. Media change is easy via the clamshell design, and it can accommodate a multitude of media up to 112 m wide simply open and drop in. Top-of-form sensing by gap, black mark or notch is standard. The maximum print speed is 100 m/sec. To save fonts, character encodings and graphics, the TDP-244 offers 8 MB RAM and 4 MB Flash. With the help of the SD card slot you expand memory as needed. Power supply, network cable and USB cable are included in the delivery order the cutter optionally.